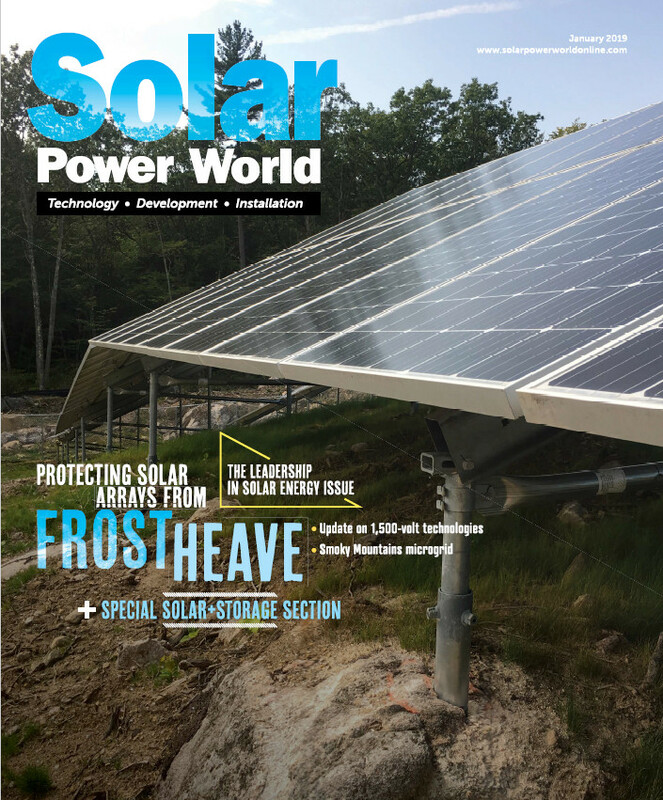 The earth anchor, long used in a variety of applications—including electric utility projects—has a new use: securing the foundations of ground-mount solar arrays. Unlike conventional foundations, an earth anchor foundation system does not require a detailed geotechnical report, extensive engineering effort or costly construction techniques. Enabling unskilled crews to install solar arrays using only handheld power tools eliminates the need for expensive, heavy equipment. And compliance with engineering specifications, applicable codes and local regulations can be verified via simple, real-time load testing. The earth anchor foundation system’s ability to work more easily, quickly and inexpensively in virtually any type of soil on any site makes solar energy more practical and affordable at any scale, and creates more profitable opportunities for agricultural, commercial, industrial and utility projects. Earth anchors function similarly to helical piles and ground screws, but with two important differences; they require less steel and can be installed using only handheld tools. The anchor itself is a hot-dipped galvanized, ductile iron casting about 5 in. long and 1.5 in. in diameter with penetrating “teeth” at one end, a hole for inserting the drive rod at the other end, and an “eye” in the center for attaching an aircraft-grade stainless steel cable or galvanized threaded rod. The anchor and cable are driven into the ground using a special drive rod—a process that is made all the easier with its narrow profile and aggressive teeth. When the drive rod is removed and uplift force is applied to the cable or rod, the underground anchor rotates into its final, horizontal and locked position. Its innovative design gives earth anchors an extraordinarily strong holding power based on the “inverted cone” of soil above. An anchor set 4 ft deep, for example, is secured by over 26 ft³ of contributing soil for a holding capacity of over 2,000 lb in most soil conditions. The ease of installation and high holding power make earth anchor foundation systems suitable for sites where deploying solar power has previously been considered impractical or impossible. The ability to conduct simple, inexpensive field load tests to measure the actual (vs. calculated) holding capacity of every earth anchor in real time eliminates the need for geotechnical reports and related inspections, and virtually guarantees being able to meet—easily and cost-effectively—the required engineering and design specifications. To ensure long-term reliability and continued compliance, Nuance Energy recommends conducting the tests to 1.5-times the calculated worst-case scenario design loads. If any test fails to reach the specified load, the earth anchor can simply be removed and installed again at a different angle and/or depth. A second anchor can then be set, with the load test performed again on the pair. Construction begins by assembling the platform and placing it in position. The height of each anchor stand is adjusted to level the racking system as it is assembled. For example, Nuance Energy’s Osprey PowerPlatform has stands with an adjustment range of 26 in., making the standard model suitable for slopes up to 12° or, with custom engineering, up to 23°. An electric or pneumatic jack-hammer, powered by a portable generator or air compressor, is the only tool needed to set earth anchors in the soil. Installation over rock or pavement requires the use of a rotary hammer drill with a suitable bit to set a conventional expanding anchor. The only other equipment needed is the portable load testing rig for performing the load tests. When the platform is fully assembled, aligned and leveled, the earth anchors are set through a hole in the base plate of the anchor stands, usually to a depth of 3 to 4 ft below grade, depending on the soil conditions. This step is completed before the solar modules are installed to make it easier to place the load testing rig over the anchor stands. Upon a successful test, the excess cable from the earth anchor is wrapped around the stand and secured. Completing the installation involves attaching the solar modules and inverter(s), routing the wires and making the connection to the electric load and/or grid. The C-rail design provides an integrated trough for the wiring, which eliminates the need for separate wire management channels or conduits. The design also provides a suitable structure for mounting the inverter(s), eliminating the need for concrete pads. A standard 16-module (2×8) array is supported by six anchor stands that distribute the total weight at under 225 lb/ft². For wind loads, all six earth anchors (one per stand) can secure a total uplift force of over 12,000 lb, depending on depth and soil conditions. Additional anchors can be set as needed, such as with unusually high winds and/or poor soil conditions. A four-person crew is able to assemble a 45-kW solar array consisting of 128 350-W panels—from start to finish—in eight hours. The cost for installing the anchor platform, rails and solar panels in a larger 2-MW system is only 1.5¢/W (using typical hourly wages for semi-skilled workers), resulting in a potential savings of over $130,000 when compared to using helical piles or ground screws. The versatility to perform well in virtually any situation and soil condition enables EPCs, contractors and distributors to have a single, modular solution for nearly all ground-mount projects. This is true even under the most challenging of conditions, such as in desert hardpan, rocky soil, permafrost or on landfills. For systems that must eventually be moved, or decommissioned and removed, the entire framework can be disassembled for use at another site. Except for the inexpensive earth anchors, there are no stranded assets and only minimal environmental impact. In projects that benefit from this “lift and shift” portability, such as mining, the earth anchor foundation system offers this significant additional advantage over all other alternatives. The earth anchor foundation system proves to be more universal, easier, faster and less expensive than other foundation options—from procurement through construction and, optionally, decommissioning. With such advantages, earth anchor foundations are destined to become increasingly popular with EPCs, developers, contractors and distributors alike for ground-mount solar projects. Could you please upload a video of the installation process? It would help understand the whole process much better.